King Faisal's life was rich with incident which is, unfortunately, a little beyond the purview of this study. To compress his early career into a few sentences, he was born Faisal ibn Husayn in 1885, the third son of the Sharif of Mecca, the semi-autonomous governor of the Muslim holy cities and environs. The Sharif was, by tradition, descended from the prophet Muhammad himself. Faisal came to international prominence from his leading role in the the 1916-1918 Arab Revolt, where he gained a reputation as a skilled military leader and a shrewd politician. His standing in the Arab world was naturally extremely high, both for his command of the forces fighting for an independent Arab nation, as well as his being a descendant of the Prophet and the son of the guardian of the holiest sites of Islam . He also enjoyed a good reputation among the British, who viewed him as somebody with whom they could usefully co-operate. We now move into the highly baroque issue of the post-war territorial settlement in the Arab world, the details of which are a little outside of the scope of this discussion. Suffice to say, the Allies had made fairly expansive promises to the Arabs about what the post-war Middle East would look like, but in the end secretly decided to divide up the region between their spheres of influence. The end of the war found Faisal and his soldiers as far north as Damascus. By this point, Syria had already been assigned to the French, but Faisal rejected the idea of a French presence in the Middle East and declared his own "Arab Kingdom of Syria" in March 1920, with himself as the monarch. Naturally the French reacted poorly to this development and dispatched their troops to the region. A short war ensued, ending in the capture of Damascus by the French on the 24th July. The Kingdom collapsed and Faisal fled to England. Faisal's monarchical career, though it seemed to have ended in disgrace, had in fact just begun. The British had not forgotten him and, following the revolts against their military administration in Iraq (see previous page), they decided to install him as King of Iraq, in the hope that his prestige among Arabs would basically help keep a lid on things, in conjunction with the occupation government being replaced with one of a more native character. Faisal had no particular connection to Iraq (his traditional power-base of course being in Arabia), but he dutifully packed his bags and travelled to Baghdad, where he was crowned King of Iraq on the 23rd August 1921 — his legitimacy coming from a very dubious plebiscite which showed that 96% of Iraqis wanted him to come over and be their monarch. "Exactly at 6 we saw Faisal in uniform, Sir Percy [Cox, British High Commissioner for Iraq] in white diplomatic uniform with all his ribbons and stars, Sir Aylmer [Haldane, General Oficer Commanding, Mesopotamia], Mr [Kinahan] Cornwallis [British advisor to the Iraqi interior ministry] and a following of ADCs descend the Sarai steps from Faisal's lodging and come pacing down the long path of carpets, past the guard of honour (the Dorsets, they looked magnificent) and so to the dais. With them was Saiyid Mahmud, the eldest son of the Naqib [a prominent Baghdad cleric] and Saiyid Husain Afnan, secretary to the Council of Ministers. We all stood up while they came in and sat when they had taken their place on the dais. Faisal looked very dignified but much strung up - it was an agitating moment. ... Then Saiyid Husain stood up and read Sir Percy's proclamation in which he announced that Faisal had been elected king by 96% of the people in Mesopotamia, long live the King! with that we stood up and saluted him, the national flag was broken on the flagstaff by his side and the band played God Save the King - they have no national anthem yet. ... King Faisal I then addressed his people. It hadn't the free élan of his impromptu speeches - it was so important a pronouncement that he had written it down and read it out, turning to Sir Percy when he came to the part about Great Britain. It was however very fine and simple and heartfelt." A better view of the coronation than one normally sees: the faint absurdity of the scene is well evident (the carpets!) The elevated platform on which Faisal's throne sat was reputedly constructed from empty crates of Asahi Beer, no other suitable material being available at short notice. Scan of a postcard in my own collection — the image seems like a second- or third-generation copy but it comes across well enough I think. Nobody in Iraq seemed quite sure what to make of Faisal initially — few would have questioned his personal courage and his dedication to the Arab cause, but it hardly followed naturally that those credentials should entitle him to the throne of Iraq, a country which he had never visited and to which he had really no connections whatsoever. But Faisal was genuinely determined to do a good job as leader: in his inaugural speech to his subjects he swore that "the nation, as a whole, is my party — I have no other." He was invariably described as charming and charismatic by those who knew him personally and, as his reign went on, his subjects were generally won over to him. He appears not to have held any sectarian views, as might have been expected from someone of his very high-church Sunni background, although his plans for empowering the country's Shia population were fairly unfocused and inconsistent. Although he was personally incorrupt, a good deal of corruption seems to have flourished under him, and he was guilty of giving preferential treatment to his old war comrades on occasion. He also demonstrated a willingness to rig elections in his favour, and to dissolve parliaments that opposed him too strongly. As usual, all the stamps here were overprinted for official service purposes. But from the British perspective, he was a safe pair of hands as monarch: while his sympathies still lay in the Arab nationalist direction, and he regularly failed to see eye-to-eye with the British, he was ultimately a pragmatist. He took the view that Iraq needed to modernise and develop before it could properly assert itself, and that partnership with the British was the only way that this could occur. Anyway, the stamps themselves. As we saw on the previous page, the 1918 occupation issue remained in use for the first couple years of Faisal's reign, until it was replaced by the 1923 pictorial issue. 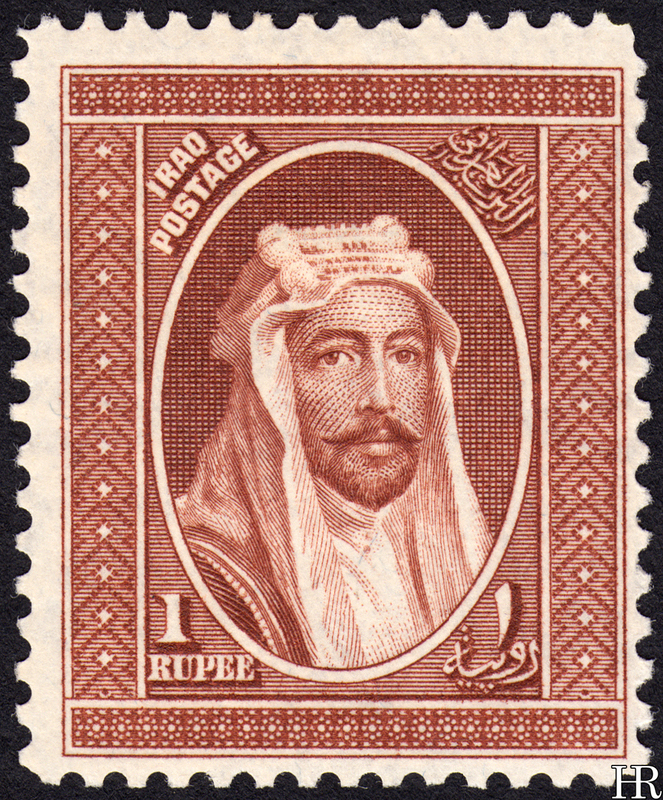 Faisal made his first appearance on his country's stamps in 1927, when a 1 rupee value was issued on the 1st April, depicting him in Arab costume. This replaced the 1 rupee from the 1923 issue, but the remainder of that issue continued in circulation. As to why this happened, I have no idea whatsoever — somebody noted the incongruity of a king failing to appear on even one of his kingdom's postage stamps, perhaps. The rest of the 1923 issue was finally retired in 1931, replaced with a full definitive set with the king's portrait which was first issued on the 17th February. Again, I can only guess as to why — the tenth anniversary of Faisal's coronation, perhaps? Anyway this is a perfectly tasteful issue, by any reckoning, but perhaps a touch less exciting than the varied pictorial designs it replaced. I feel the likeness of the king is never quite perfect but from a purely technical viewpoint there's nothing at all to complain about here. We have Faisal in western attire on the lower values, and the 1927 1 rupee design is recycled for the highest value. As we progress through the country's stamps, we'll become very well-acquainted with the frame designs here — they survived two changes of monarch and lasted all the way to 1948. This is the first of a few tricky issues: the 1927 1 rupee is seen used quite commonly, but mint is somewhat scarcer. The 1931 stamps are, in the main, not incredibly common (though are mostly cheap when you can actually find them): no doubt a consequence of the fact that they were only in circulation for a little over a year. The highest value, the 25 rupee, is ludicrously expensive: Gibbons has it at £900 mint and £1,100 used, and from experience the Gibbons prices for higher-end Iraq items are generally accurate (too low, if anything). The 10 rupee is pricey enough as well. I have this issue complete otherwise, although in somewhat varying quality, which again comes back to my difficulty in actually finding these. Very far outside the scope of this discussion but I think it would be remiss of me not to note in passing that the Arab Kingdom issued a few stamps, of a crude but not unpleasant design, during its short existence. Can't find any public-domain images of these so I must resort unto the awful black-and-white illustrations Gibbons still uses. The British seem to have actually regarded this as a plus, rather than a minus — a lack of local support deprived Faisal of anybody he could trust to side wih him against the British, as an incentive to keep him in line. Whether the 1931 1 rupee replaced the 1927 1 rupee at this point, or whether instead they co-existed, I again do not know.